Your overhead door system can run into a number of problems over time. You could be dealing with a faulty opener or bent tracks may be hindering your door’s smooth movement. Our team understands how to tackle these kinds of issues, regardless of the faulty component. No matter the type of spring your system uses, they will eventually become worn out from regular use. 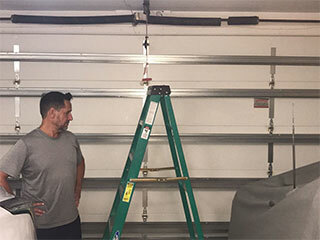 Springs need to handle a lot of weight each time it opens and closes – as a result, they'll need to be replaced at some point during the lifespan of your garage door. If these parts end up breaking or snapping, this will cause your door to shut forcefully, disrupting your whole system’s performance. You can count on our team to be there when this type of situation occurs. Our technicians will remove your broken spring and replace it with a new one. We encourage you not to try and handle anything by yourself – these components can be dangerous to work with. Your opener is a complicated device containing a number of parts that could develop troublesome issues along the way. Circuit boards, motor gears and the safety sensors can all develop malfunctions over time. No matter what the issue is, our team will be able to recognize the underlying issues and get your system back to full working order again. Over time, your system’s hardware can begin to deteriorate. This includes the tracks, worn out rollers or broken panels. A wonky track or seriously corroded rollers can impede your system’s overall performance, causing interruptions or even leading to a premature breakdown by placing extra stress on other parts of the system. Our team can help you repair or replace any damaged parts to get your system working once again. If you're in need of expert assistance when it comes to your automatic door, don’t hesitate to contact us. Our team at Garage Door Repair Santee are here to help!